Today we caught up with illustrator Len Peralta, who is illustrating the upcoming Star Munchkin Guest Artist Edition. Q: Len, thanks so much for taking a few minutes to chat with us. Can you tell us a little bit about how your illustration style has evolved over your career? A: Wow. that's quite a question! I like to think that it is constantly evolving and changing. I guess the real question is, who are the artists who have helped shape and evolve your art. That's an easier question. When I was 23, I made a bunch of notes in my sketchbook of artists who I admire. A list of my influences, so to speak. Tim Burton, George Plympton, Edward Gorey, Berke Breathed. Gahan Wilson. Charles Addams. Over the years, I've added artists like Scottie Young, Jim Lee and Leinil Yu to that list. They've strongly influenced my style and added a lot more depth to it. I've tried my hand at digital painting with the last season of Geek A Week and I learned a lot in that time. To a certain extent, I'm trying to avoid becoming static and try different techniques and styles. About three years ago, I made the switch to 100% digital and that has informed my analog work in more ways than I can imagine. But I think I prefer the digital work, especially during the layout phase. I hope that answers your question! 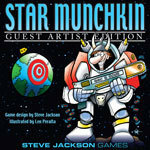 Q: Talk to us a little about doing the guest artist edition of a classic game like Star Munchkin. What most excites you about this? A: I remember at one point while working on the project, I stopped and tweeted something like "I'm working on something so much fun, I can't even believe I am working on it." And it's 100% true. Working on a game like Munchkin, especially Star Munchkin, has been an absolute dream come true. It was a lot of fun re-interpreting John's work and trying to put my own spin on things. Although, John is SO good. It was a real challenge. But I wanted to pay homage to John's work while giving a new flavor to the game. 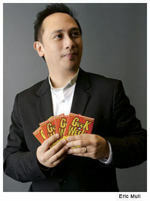 Q: You are the illustrator for the Munchkin The Guild booster and the originator of Geek a Week series. Did you find it easy to adapt your personal style to the world of Munchkin? A: I think my style fits well within the Munchkin world. As I said before, I was trying to keep that Munchkin feel and pay homage to John's work, while still trying to bring my style to the game. The art of Geek A Week has evolved a lot too and I was lucky enough to bring my painterly art style to a Spyke Geek A Week card last year. I'm just happy to be a part of the project. I hope I'm able to breathe some new life into this classic game. I'm really looking forward to the release and seeing Munchkin fans everywhere trying out the game! Thanks so much to Len for sharing with us. Keep checking back here for new information about the Guest Artist editions!